The American Cane System is a traditional martial art style founded by Grandmaster Mark Sheuy, Sr. that uses a cane to strengthen individuals mentally, physically and emotionally. Grandmaster Shuey is the head of the Cane Masters International Association and holds advanced black belt ranks in Hapkido (7th Dan), Tang Soo Do (6th Dan), and Tae Kwon Do ((8th Dan). The American Cane System has 8 levels from white belt up to first degree black belt, followed by ten levels of black belt, including the title of Cane Master. This instructional series was created as a means of documenting the core of fundamental information required to test for each level up to first degree black belt. While intended for American Cane System students, this series is beneficial for anyone wishing to learn more about the versatility of the cane as a tool for self-defense and exercise. 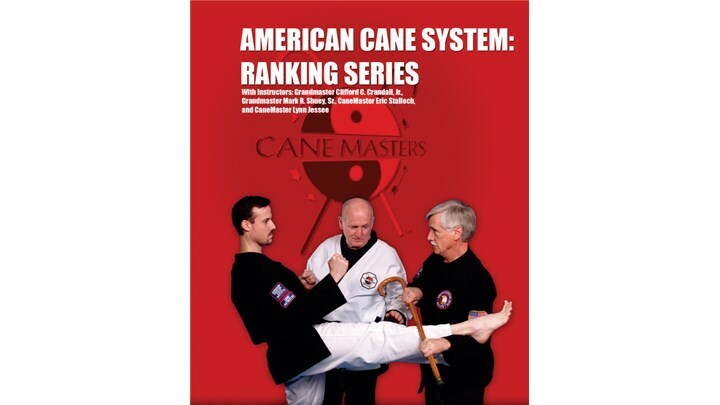 This video introduces the New American Cane System student to the style's fundamentals, including an overview of the system and its founder, safety and training considerations, parts of the cane and how to work with and without a training partner. This video was professionally filmed and edited using three different camera angles and documents the material required to test for Yellow Belt. Level 2 builds on the American Cane System (ACS) student's level one knowledge introducing the philosophy of the ACS and traditional martial arts concepts including style structure. New topics include training on a heavy bag with a cane, partner drills (blocking and striking cane vs. cane with a partner), and a more in depth look at the Exercise System. This video was professionally filmed and edited using three different camera angles, and documents the material required to test for Orange Belt. Level 4 prepares the American Cane System student for the advanced material and concepts that exist at levels 5-8. The emphasis for quality in the material at levels 1-3 continues, and 13 new self-defense techniques are added which include throws, defenses against kicks, punches, grabs, attacks from behind, and attempts to take your cane. As with each level, Grandmasters Shuey and Crandall introduce the student to new traditional martial arts philosophy and concepts including the student-instructor relationship. Level 6 marks a shift in the American Cane System student’s training from “scientific/systematic” skills toward self-defense. This is strongly presented in both the techniques and kata. 17 new self-defense techniques are taught (CTs 48-64) involving joint locks, double-punches, cane retention, disarming an attacker (such as wielding a stick or pipe), defense against underhand and overhand knife assaults, and more. The video begins with an in-studio interview with Grandmaster Mark Shuey, Sr., introducing the student to more information about the style’s founder and his background. Level 7 prepares the American Cane System student to test for BROWN BELT, one step below 1st degree black belt. The video begins with an outdoor interview with Grandmaster Mark Shuey, Sr., filmed as television coverage of the system, and it presents some of his philosophy and beliefs for the style’s future.